We welcome Lauren Clark back to CLC today. The last time she was here was in 2016, as Laura McNeill. No matter which name she goes by, she's a sweetheart and we're glad to reconnect with her. Lauren is here to talk about the Disney character she is most like, going along with our theme of Disney and Fairy Tales. She has TWO copies of her latest novel, The World Breaks Everyone, to give away (one print, one e-book). 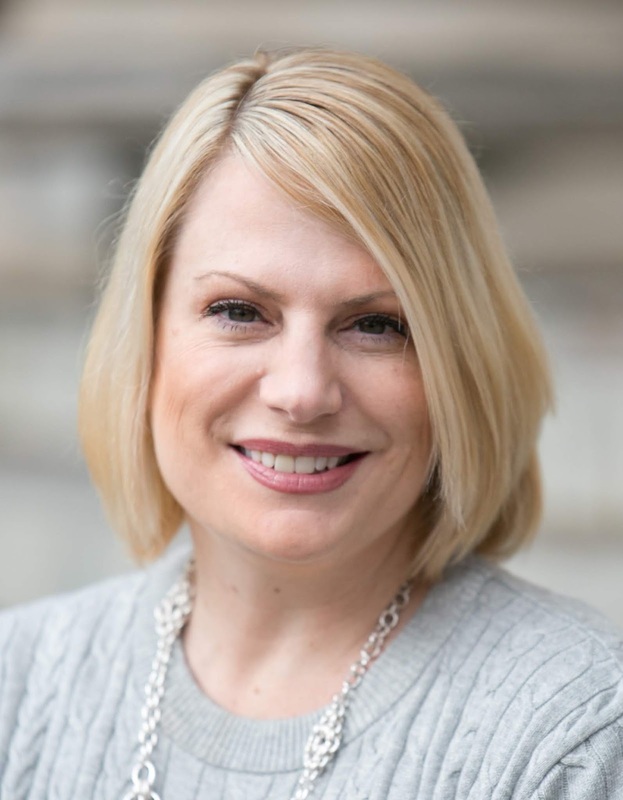 Lauren Clark is the author of several award-winning novels, including Dancing Naked in Dixie, Stardust Summer, and Stay Tuned. She also writes suspense under the name Laura McNeill. Center of Gravity and Sister Dear have been published by HarperCollins. Visit Lauren at her website, Facebook, Twitter, and Instagram. I am responsible for my mother’s death. I’m on the run. It’s me against the world. I cannot let it break me. When sixteen-year-old Olivia Jacobs and her celebrity chef father are brutally attacked after his French Quarter restaurant opening, the shell-shocked Olivia finds herself on the run on the streets of New Orleans. From the first moment feisty, headstrong Merida appeared in Brave, I loved the 16-year old Scottish princess. She is anything but a stereotypical royal—athletic, bold, brave, and daring—never a damsel in distress. Much like me, Merida holds much curiosity about the world around her. She is a bit of a dreamer and often thinks about the legends and myths of her kingdom. I always loved to discover new places as a child, similar to Merida, who enjoys the outdoors. In the movie, you can tell that she loves spending time exploring the forests that surround her home. I probably would not have scaled Crone's Tooth and tried to drink from the fire falls, but I definitely cheered her on as she attempted what only the bravest kings have done. One of my favorite games as a child was playing hide and seek, which we see Merida enjoying in the movie. She is very fond and protective of her younger triplet brothers, Harris, Hubert, and Hamish. Like Merida, I also had younger brothers (not triplets, thank goodness!). She also shows her softer side with her horse, Angus, preferring to care for him herself. Merida is devoted to her archery skills and though I have never found a loophole in an archery competition to “shoot for my own hand,” I do love playing sports and the challenge of friendly competition. I played soccer, field hockey, and softball in high school, and still enjoy swimming, though at a more leisurely pace! Merida showed part of her tenacious personality when her cake spell went awry. When her mother turned into a bear, Merida didn't rely on anyone other than herself to fix it. I prefer to solve my own problems, as well, and tend to be stubborn and don’t want to ask anyone for help! I could relate to Merida being often irritated with her mother; seeing her instructions on how to be a "proper" princess tedious and boring. Rather than following social etiquette and good manners, Merida takes control of her own destiny, despite her mother’s warning that her actions could harm the kingdom. I definitely saw my teenage self in Merida’s behaviors. While I was (overall) a well-behaved daughter, I did have some moments I look back on and wonder what in the world I was thinking! 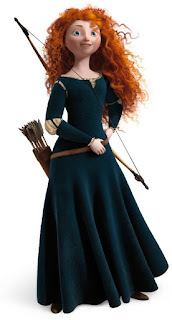 Merida stands apart from many other Disney/Pixar heroines, as she made clear she wasn't interested in suitors. She even says, "I may never be ready for this." The final scenes of the movie, rather than centering on a love story, focus on her relationship with her mother—exemplifying that families can be repaired and strengthened through patience, bravery, and love. I had such fun watching Merida grow and change throughout the movie. She begins the film, Brave, as a rebellious and impulsive girl but soon learns to become more understanding and open-minded. 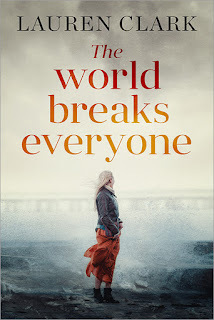 I definitely see my younger self in Merida—and I also see 16-year old Olivia Jacobs, the heroine of my new novel, The World Breaks Everyone. Both Olivia and Merida stay true to their core values and temperament throughout, remaining brave and loyal to those they love most. Thanks to Lauren for visiting with us and sharing her book with our readers. Giveaway ends November 18th at midnight EST. Would love to read your novel and I also identify with Merida! I was very brave throughout my breast cancer treatment which was faced with strength and courage. Your book is captivating. I felt brave when I stood at my sons banquet and spoke! I was brave when my mother was diagnosed with breast cancer years ago. I was brave in the period that my mother passed away. Standing up for my children was right and brave. I felt brave as I walked through my mother’s journey with ovarian cancer. I found out how brave I am when I was getting divorced. I was brave when I cared for my sick mother. I'm not brave very often, but when I left my first husband, I was very brave. But I had visited a therapist several times prior to it to make sure I was doing the right thing and to help get the courage to do it. I was brave when my mother was diagnosed with dementia. Spotlight and Giveaway: Memoir Mania!